UFO floats over the heads of him! Date of the observation: June, 1969, Time: 09:15 p.m.
A wonderful summer evening, June 1969, something strange to me at the time happened - very strange. It was a wonderful hot summer evening, cloudless and pleasant. Two of my friends, picked me up from school about 8 kilometers from the city Fasterholt, which is between Brande and Herning. We were driving on our mopeds, mine was a new "SCO-named" moped, as I was proud of, while the others were proud of their greater puch mopeds. The time was around 9:15 PM this evening, so twilight was gradually slipping on, but it was still bright and clear. Suddenly, we were overwhelmed by a strong whisteling sound, and just a few seconds later, we saw a giant, terrifying object just above our heads...... and a few seconds later, it stopped immediately to the right side of us ...... it was just there in the air ...... quite close to the ground, perhaps only 100 meters above the ground ...just around 50 meters from us. There was complete silence. Not a sound could be heard. Ghastly. Behind the small round windows in the large round object, which were hovering close to us, we could see creatures, and that made us even more afraid. After a few moments (the length of time is not known, everything came to a standstill- even time), the UFO moved forward .. but without sound !!!! ... Only a very weak whistle sound from the wind could be heard. I started to lighten up ... but ohhh no, very shortly after it stopped again. By then I was really afraid, I have never been so afraid in my life. My heart galloped as never before, and my fear increased. I became very dry in my mouth (caused by fear). I had heard people talk about such beings and incidents, but until now, I had actually referred to them as someone with a lively imagination and had not see it as the truth. But now, it all became reality. Was I dreaming ? No, it was real. 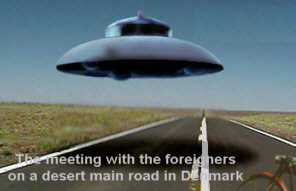 The meeting with the UFO subject, took place 1,2-2 km. outside the city Fasterholt, which lies between Herning and Brande. When I came home I ran to my mother white as a sheet in the face, to tell her about my observation and experience. My mother was not surprised or shocked by my experience, but said that they were here - the aliens, but that I should not run around and tell my experience to everyone. I was really terrified by my observation ... so I studied the sky almost every evening. I saw a lot... which only could be things that was not from this earth... and each time I ran inside the house to get my mother, and wanted her to come outside, so I could show her my observations. And then one day, my mother garbed my by the arm and said to me: "Poul-Erik, it has to stop- don´t talk about it anymore", to which I replied well mother, they are here... I have seen them ... I have seen them ... " "Yes", she said, "I know, but it is not something we are talking about ...... let it remain a secret. I asked her why I could not tell the truth, I had seen, experienced and met them ...... and my mother told me that if I did not stop talking about it, I would be taken away by the blue wagon. (The blue wagon was a name for the Danish authorities, removal of a person gone mad, to a mental hospital (as it was at the time)). So I kept my silence and maintained my secret for many years. 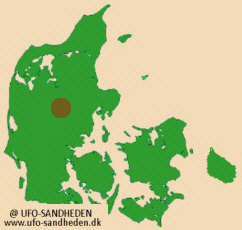 I was not alone with meeting the UFO, which took place about 17 km south of Herning, 1,2 kilometers outside the city Fasterholt. My comrades and I, were not the only ones who had seen and observed this Unidentified flying object, however, only we had been so close to it, and had the very close contact with the foreign visitors. 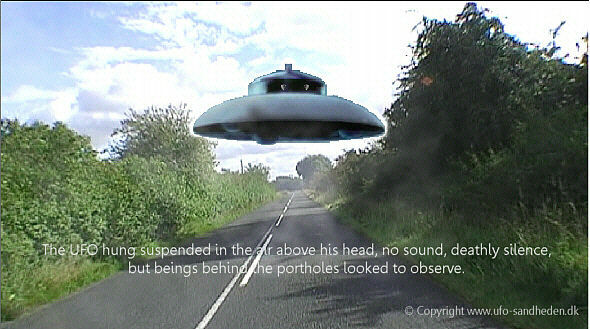 A bus driver who observed the UFO-subject 5 km. outside the city Lind by Herning, stopped the bus, which was filled with 23 people, and asked them all go outside and look up to the sky. Never had they seen anything like it. Some were very afraid and frightened. 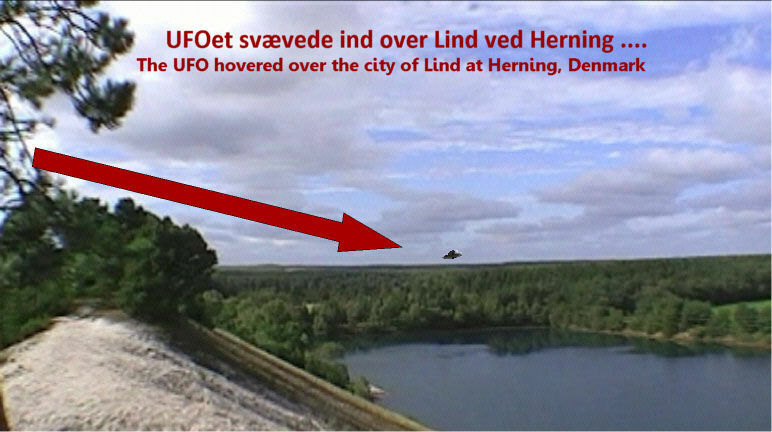 The UFO these individuals saw, was the one we had seen also, and it had moved from Fasterholt to Lind/Herning city. From here, they all confirmed that the object was completely silent. The Danish Air Force were contacted, and they confirmed that they did not aircrafts, nor glider and similar in the air that night, and that they had also noted subject on their radar! This incident woke the interest for the mysterious objects. Many others in the city Fasterholt (by Herning) could be as good as daily in the period 1969, see flying objects (UFO´) on a military lookout tower around 1,5 kilometers outside the city of Fasterholt in the direction of the city Arnborg. On several occasions the "others" would like me to come see even more objects at night, but I was still so shocked by the personal meeting with UFO, that I simply did not have the courage to be confronted with a new close encounter.